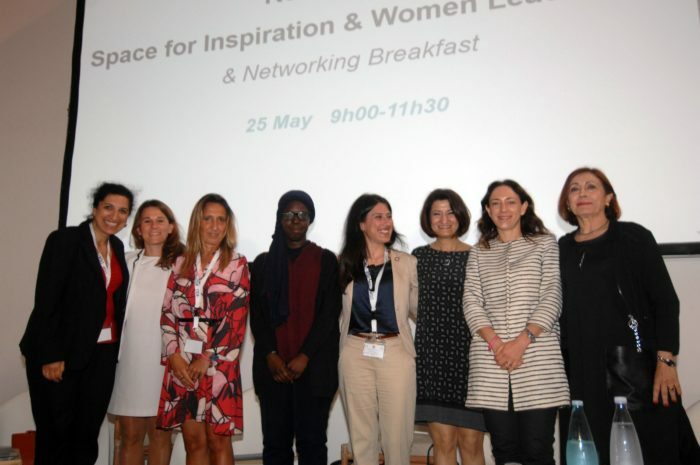 On the 25th May 2018, NEREUS attended the Round Table “Space for Inspiration and Women Leadership” & Networking Breakfast, organized by the Distretto Tecnologico Aerospaziale (DTA) as a side event of the Global Space Economic Workshop “Space Cybersecurity for Mobility”. With its presence, NEREUS supports the event’s contribution to achieving some of the Sustainable Development Goals (SDGs), to build a well-balanced and diverse workplace, to contribute to STEM’s pipeline development, to stimulate more women to undertake studies in aerospace and cover leadership position. 10 women shared their personal background that led them to the space field. NEREUS Secretary General Ms. Roya Ayazi, from Berlin but working in Brussels, highlighted that there are many interesting professions and study domains related to space not only astronauts and engineers but a broad panorama of different disciplines needed to prepare exploration missions but also to develop space markets and link them with society. Quoting her own experience, she described how her background as a lawyer brought her to the field of EU Affairs advocating for a stronger regional dimension of EU space policies and programmes.